Fischer Connectors has announced the launch of its new Freedom Series, which offers breakthrough plug & use connectivity solutions that are easy to use and integrate. These new solutions are designed for portable and IoT (Internet of Things) applications in a wide variety of markets such as defense, security, medical, industrial and civil engineering. 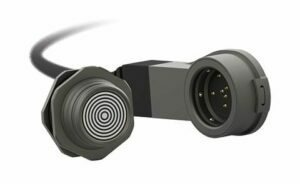 Breakthrough 360° mating freedom enables the Fischer LP360 to be plugged and routed in any direction, so the cable can always go straight to the device. It is also possible to opt for cable-free solutions by integrating the plug directly into the device’s housing. By submitting this form, you consent for your details to be sent to the above named organization and its authorized partners in order to respond to your inquiry. Depending on the location of the organization, your personal information may be transferred and processed outside of the European Economic Area. Full details about how your data is shared are included in our privacy notice.